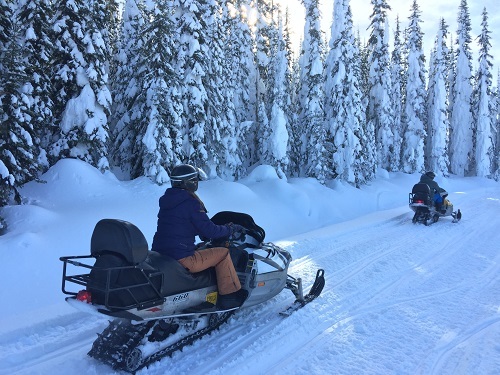 Sun Peaks Snowmobile Tour - Scenic, Fast and Fun! Sun Peaks Snowmobile Tour - awesome adrenaline inducing fun! 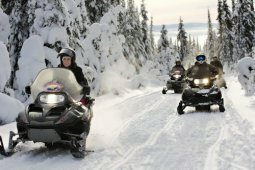 Sun Peaks Snowmobile Tour – awesome fun at Sun Peaks for those with a need for speed! These adrenaline-powered tours are a favorite Sun Peaks winter activity for everyone – skiers and boarders who want to give their legs a rest, or non-skiers who want to explore and see the beautiful snow-covered mountains around Sun Peaks Resort. Enjoy the beauty and perhaps even the virgin powder that covers everything in sight. Make fresh tracks or follow the leader! It's all good! Pre-scheduled 2 or 4 hour tours go out daily, as well as evening tours and wiener roast at McGillivray Lake adventures. Trips can be tailored to suit the needs of the guests, and custom family tours or thrill-seeker tours can be arranged. You can also include an hour long wiener roast at McGillivray Lake as part of your tour, or add on an extra hour to your snowmobile tour. These exciting tours head out and away from Sun Peaks and into the scenic back country, down open logging roads, through snow-covered trees, into select bowl areas and onto wide open frozen lakes where you can let loose your need for speed! You need a valid driver’s license to operate a snowmobile, or you can hop on as a passenger. Kids are of course welcome, but must be approved by your tour guide first to ensure safety for all. Safety gear and protective, warm covering is available (except gloves) and you should book in advance to ensure your spot on these popular winter tours. Adrenaline pumping fun for the whole family or for your group of excitement seekers! Inquire for custom tours and extras. Complete the online form below to get in touch with Sun Peaks snowmobile tours or visit the Adventure Centre located in the Village Day Lodge. Gravity fed Sun Peaks ski-bikes are also great for speed-lovers! If a slower speed is more your idea of fun, consider a Sun Peaks Snowshoe tour or Horse drawn sleigh ride around Sun Peaks.